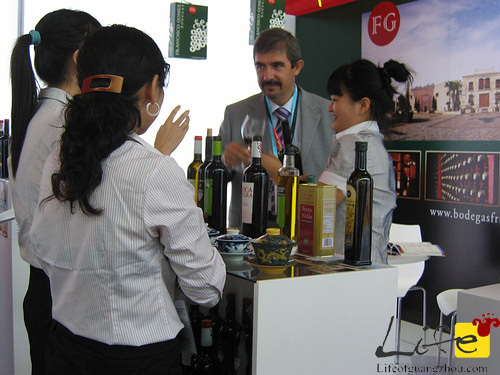 Wine and olive oil gain from Spain large expectation in the 6th CISMEF. The sixth China International Small and Medium Enterprises Fair (CISMEF) opened yesterday in Guangzhou’s Pazhou Complex. The 4-day fair will be presenting over 6,000 companies including 1,500 foreign companies. The fair includes 13 zones covering food and drugs, toys and crafts, textile and clothing, electronic appliances, hats and bags, energy-saving goods, furniture and lighting, machinery, ceramics and building materials, tea, financing, and e-commerce. Spain is this year’s highlight presenting over 150 local enterprises to visitors. The 10,000sq meter Spanish hall is separated into four parts with a government section, famous brands section, enterprises section and the theme section. The low-profile hi-tech projects, beautiful tourism resources, unique architectures, and delicate food such as cheese, wine and olive oil from the romantic Spain gain more recognition in this SME fair. Spain just opened a Consulate General in Guangzhou’s CBD Zhujiang New Town on September 21st. On September 21st, Spain opened a Consulate General in Guangzhou. Located in the CBD Zhujiang New Town, both the Economic and Commercial Office and the Tourism Office opened that day. Mr. Miguel Sebasti¡§¢n, Minister for Industry, Tourism and Trade of Spain addressed the opening ceremony that “The newly-launched Economic and Commercial Office is to promote friendship and cooperation between Spain and China.” He also said that Guangdong has huge economic potential which is presently very appealing to Spanish enterprises and the establishment is not only to bring Spanish enterprises to China, but also to promote investment from China to his motherland. The Guangzhou International Beauty & Cosmetic Import-Export Expo (Guangzhou Beauty Expo) is a well-acknowledged theatre for stage events and educational opportunities devoted to the hair professional in China. 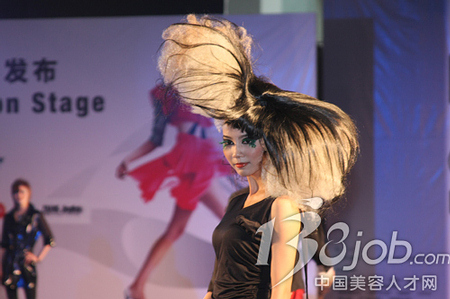 Hairstylists from all across China will once again congregate at the coming 31st edition of the Guangzhou Beauty Expo in autumn 2009 to share techniques and discuss style trends, and this time, with a particular focus on the development of a New Generation of Chinese hairstylists. International visitors to the 2009 Canton Fair may face some new obstacles in preparing for their trip. New visa requirements are in place in China since the 2008 Olympic Games. 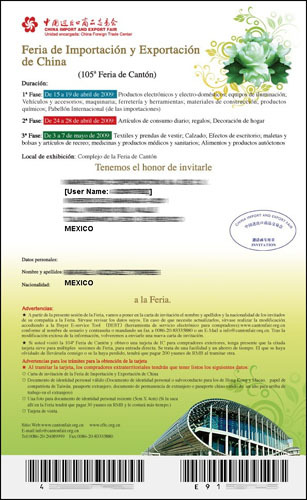 Visitors are required to apply for their visas in advance and must have a business-related invitation letter along with their Chinese hotel booking and return flight information. Gathering all of these items can be a challenge, but Wentrip.com, a distinguished travel company based in Guangzhou, is uniquely prepared to help visitors attending the Canton Fair. The China Import and Export Fair, commonly known as Canton Fair, is China’s oldest and largest comprehensive trade fair. Held twice each year, the fair includes a large variety of exhibits and draws businesspeople from more than 200 countries. During the Fair, travel to Guangzhou is at its peak and travel agencies are busy handling the influx of visitors and requests. Wentrip.com is one of only a few agencies who have a professional Canton Fair Division dedicated to serve visitors to the Fair. During the Fair, all of the travel agencies in Guangzhou are at their busiest and most of companies must hire short-term workers or students to handle the load. But Wentrip’s Canton Fair Division is made up of only highly-efficient and experienced full-time workers. These professional service personnel have mastered the various fair-related issues. Credit card fraud is another concern for guests traveling to China, and many are reluctant to send copies of their credit cards to travel agencies in China. Wentrip.com allows guests’ credit card payments to be processed in the United States, utilizing advanced technology to protect their customers. The customer is protected by U.S. laws, providing a more secure way for travelers to pay for their needs. The Canton Fair is an event that businesspeople do not want to miss. Wentrip.com is poised to help them overcome the obstacles to international travel so travelers can focus on business. Their professional service agents are thoroughly familiar with Guangzhou, its hotels and streets and the manner in which business is to be conducted. Their knowledge of the Canton Fair and their extra services are sure to make traveling to the Fair easier, safer, and more enjoyable for their clients. 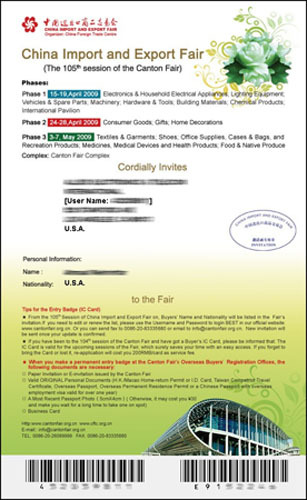 You are currently browsing the archives for the Canton Fair 2009 category.